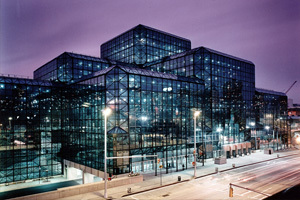 Union jurisdictions at the Javits Convention Center in New York involve three major unions. The first is the Teamsters Union. They handle the freight at the exhibit hall. They unload trucks or vehicles and deliver materials to and from the booths (drayage). They also provide rigging of machinery, moving services and spot machinery in your booth. The standard rigging crew typically consists of two men and a forklift. The second is the Carpenters Union. Carpenters handle the erection and dismantling of all exhibits and displays. They may be hired from the general contractor or from an independent contractor, such as Momentum Management Inc. Carpenters uncrate and re-crate machinery or equipment. They also install all pipe and drape, skirting, all flooring, such as carpeting, and assembly of all non-lighted signs. The third is the Electrical Union. Electricians handle all electrical work. This includes supplying power lines to your booth, connecting equipment to outlets, and installing signs or headers that are lighted unless they are permanently attached to the exhibit back wall. You may not lay your own internet wires or plug anything into an outlet. The GC may use apprentices and Journeymen, but EACs may only use Journeymen. What can exhibitors do without union personnel? Not much! The Set-up can be accomplished in 1/2 hour or less. Individuals performing the work must be full-time employees of the exhibiting company and cary identification to verify this fact. Exhibitors are allowed to unpack and repack their own product (if it is cartons, not crates). They are also allowed to do technical work on their machines, such as balancing, programming, cleaning of machines, etc. Exhibitors may “hand carry” or use nothing larger than a two wheel baggage cart (rubber or plastic wheels only) to move their items. Exhibitors may move a “pop-up” display (equal or less than 10’ in length) capable of being carried by hand by one person. The individuals moving the items must be full time employees of the exhibiting company and must carry identification to verify this fact. At the Javits Center, all material such as draping, table cloths, decorative fabric, tension fabric, etc., must be nonflammable and fire-resistant in accord with the standard established by the New York Fire Department. Affidavits attesting to flameproof compliance must be submitted upon request. In New York, straight time rates are from Monday through Friday, 8am-4:30pm. Overtime rates are incurred outside of those hours on Monday through Friday as well as all day on Saturday. Sundays and holidays are double time. Lunch is from 12:00 – 12:30 pm. These times may vary between different contractors. If you would like to receive a free quote for you trade show exhibit installation and dismantle in New York, please call us at 1-866-685-8950 or complete the form below to have someone reach out to you.